Along with this whole unexpected remodel, there has been some redecorating going along with it. 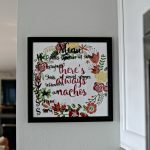 When we first bought our house, we knew that the giant wall in the living room would be perfect for a projector; however, now that we have moved our main living space into the room off the kitchen I’ve been redecorating this front room. 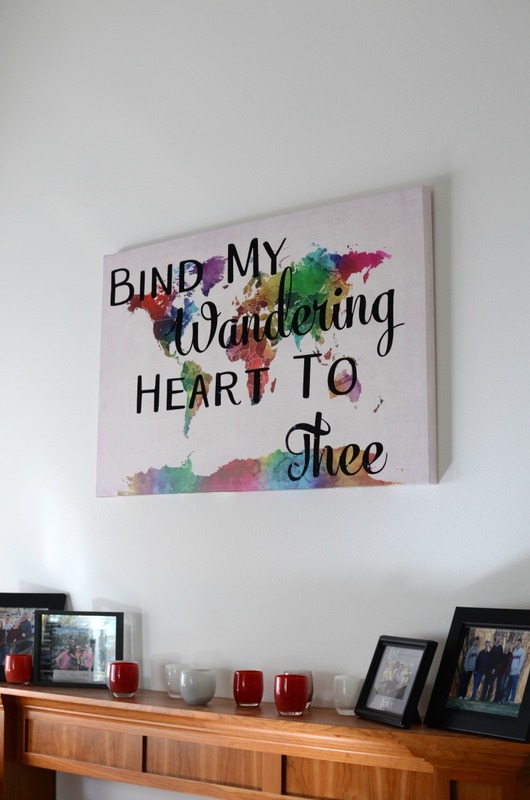 While looking for decorating inspiration on Pinterest, I saw a small canvas with the worlds “bind my wandering heart to thee” (from the Hymn “Come Thou Fount of Every Blessing”) painted over a map. I liked the idea of this; but since the wall is huge, I needed the artwork to be large as well. I started this project with a Large World Map Watercolor Canvas. 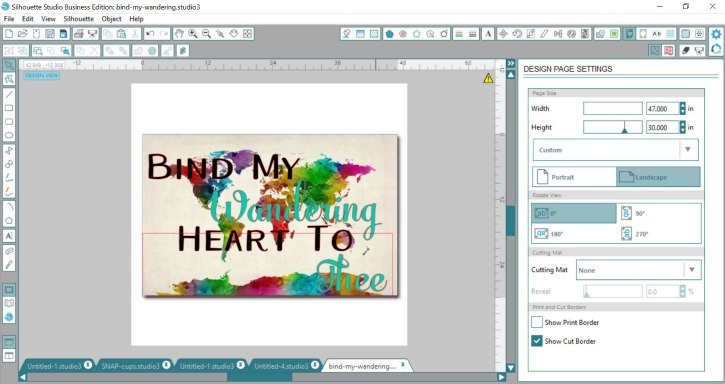 I wanted to be able to see how the worlds would line up with different continents so I used Silhouette Studio to do a mockup of the final project using a photo of the canvas for the background and sizing the work area to my final canvas size. This allowed me to play around with different fonts to see how they would look together and fit on the canvas in their full size. I also tried to do a mixture of colors; however, in the end I decided to do everything in black vinyl and then use the fonts to make certain words stand out. I was definitely glad to have my Silhouette Roll Feeder for this project. Each line of words is just under 12″ tall so I cut it all out in one giant line. Once it was weeded, I discovered that the hard part was definitely not behind me. Even though I was using Orcal 651 (which is permanent outdoor vinyl) it did NOT want to stick to the canvas. I picked up some repositionable spray adhesive to help the vinyl stick to the canvas while I removed the transfer tape. 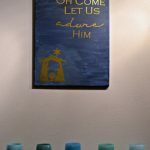 Once everything was transferred onto the canvas, Brad helped me hang it above the mantle in the living room. I am so happy with how it turned out! 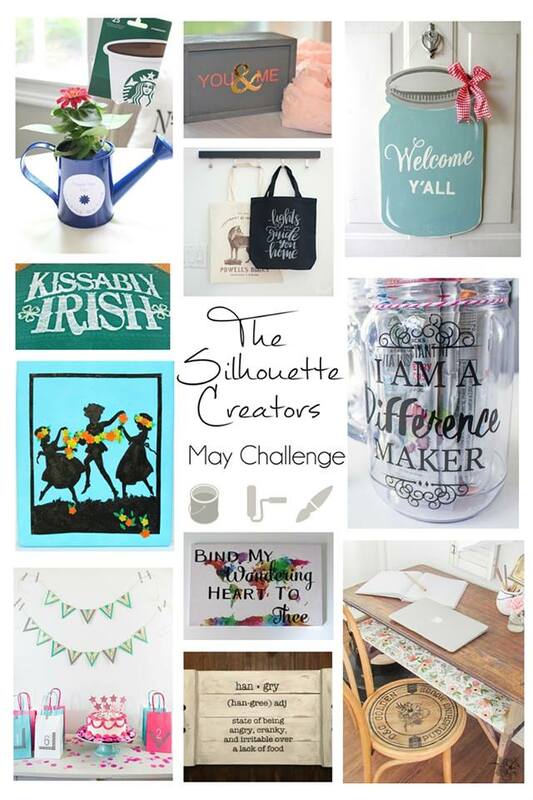 This month, I’ve also teamed up with a few of my favorite fellow Silhouette bloggers to bring you some fun projects. Make sure to check out their posts below. Such pretty decor! And such a fun project. Love how it turned out. That is a great project!! Love it! The multicolor effect is beautiful and the quote perfect! This looks great! Nice job on it, Kendra! I never thought about uploading a photo to the Silhouette. Great way to trial something. 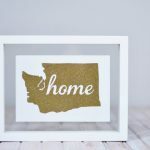 I love maps and now you got me thinking…hmm what canvas can I paint words on now. I just love this! Beautiful art, beautiful quote. Gorgeous! So pretty! Love the black lettering against the watercolors. Visiting from Saturday Sharefest. I love decorating with maps. The colored continents in the background are very eye-catching. Great quote/lyric! Ohhhh, that’s so cool. 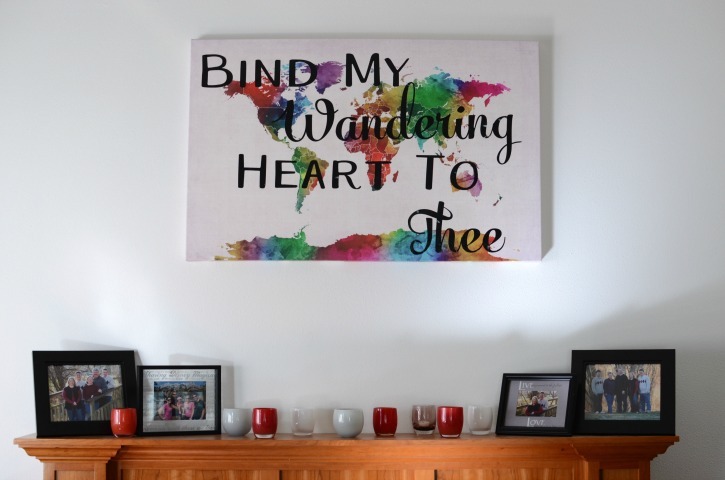 As a person with itchy feet and a wandering heart, this canvas speaks to me. I’m impressed that you put it together yourself! It’s lovely! 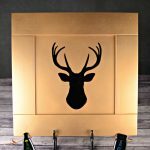 This is a great way to personalize artwork. I’ll have to see if I can do this for my daughter’s room. Thanks for sharing this on Merry Monday. I love maps! What a great idea :) Thanks for sharing with us at Funtastic Friday!